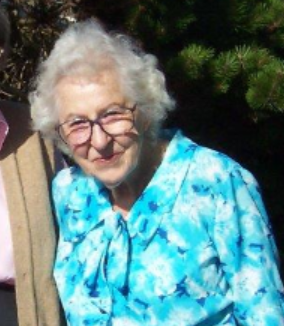 Anna Lou Case, 98, died Oct. 11, 2015, in Newport, OR. 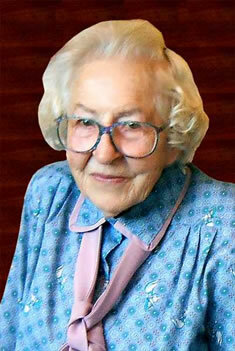 Mrs. Case was born in Clackamas County, OR on Dec. 22, 1916, to Albert and Nellie (Yoder) Eyman. She grew up on the family farm near Molalla, OR, had her own horse, and learned to swim in nearby Bear Creek. She took her only plane ride with her father in 1925 when she was eight years old. Mrs. Case graduated from Oregon College of Education in Monmouth, and began her teaching career at South Oak Grove School in Liberal, OR, in 1937, where she taught all eight grades. She retired from teaching 43 years later, having last taught third grade in the Canby, OR school district for 30 years. She earned a Master's Degree from Portland State University in 1972. On Jan. 20, 1939, she married Franklyn A. Case. The couple lived in Barlow, OR for about 15 years before moving to Canby. They purchased a home in Yachats in 1987 and visited there for a year. Franklyn died on Oct. 20, 1988. In September 1990, Mrs. Case moved to the Yachats home. In Yachats, Mrs. Case became active in the Little Log Church, devoting many days to staffing the museum for visitors and serving both as curator and as a board member. She was well known for her daily walks to the post office, a one mile round trip. She often made the trip twice, as she did the day before she suffered a stroke. Mrs. Case is survived by sons Clinton (Marie) Case of Reno, NV and Marvin (Anne) Case of Battle Ground, WA; grand­daughters Annette Case of Seattle, Heidi (Dan) Wetzler of Battle Ground and Robin (Gary) Murtha of Texas; grandson Travis Case of Eugene; sister Lucia Schuebel of Mulino; great-grand­daughters Savannah Wetzler of Battle Ground and Macy Murtha of Texas; great-grandsons Stefan Wetzler of Battle Ground, Greyson Murtha of Texas and David Abraham Case Ake of Florida; step-great-grandson Dan Wetzler of Texas; and step-great-granddaughter Lauryn Murtha of Texas. Mrs. Case was preceded in death by her husband, Franklyn Case, in 1988, brother Steven Eyman in 1999, sister Roberta Daniels in 2015, granddaughter Hillary Case in 2006, and nephew Paul Eyman in 1999. Donations in Mrs. Case's name are invited to The Nature Conservancy, 821 SE 14th Ave., Portland, OR 97214, or other environmental support organizations. Celebration of life services will be held Sat., Dec. 19, 2 p.m., at the Yachats Commons in Yachats, OR. The Canby Funeral Chapel handled arrangements.